O'Chrey primary school is a school in Ochrey Village, Baraing Thleak commune, Phnom Prik district, Battambang province in northwest Cambodia. It was established in 2006 by villagers themselves who decided they must act if they wanted their children to have some formal education. The school was recognized by the Ministry of Education, Youth and Sport six years later, or in 2012. The structure used to be a storage house for corn, measuring only 6 meters by 5 meters. Its rooms were made of wood and its roof, of Zinc. It stood under a tree, near a farm. It did not have walls. There were two classrooms standing on the community-owned land. Enrollment continued to increase despite these conditions. For the academic year 2013-2014, there were 175 students. For 2014-2015 , the number could increase to 219. But school principal Mr. Pot Saroeun said there were only three teachers, two of whom are contracted. Worse, one of these two will resign because of the low salary that could not support her living condition. 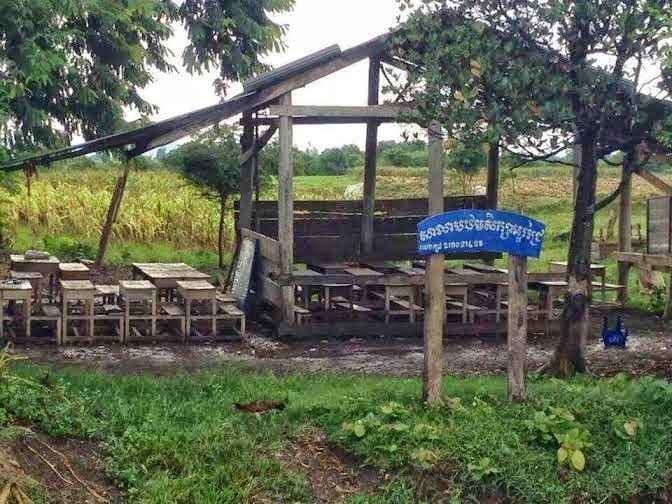 In August 2014, the project team of Checkmyschool -- managed by the Khmer Institute for National Development (KIND) and the Affiliated Network for Social Accountability in East Asia and the Pacific (ANSA-EAP) -- released a statement to the Cambodian government and other stakeholders to help improve conditions in O’Chrey primary school. Specifically, the letter asked for help to construct new classrooms before the new academic year started. Help was quick to come from other non-government organizations, charities, and the media.. Three radio stations immediately broadcast the sorry situation of O”Chrey primary school. On August 21, it was radio Sarika FM 106.50. The following day, it was radio Australia. On August 31, Radio Free Asia helped make the appeal. Cambodia Mine Action Center (CMAC) of Siem Reap branch provided the school building with four rooms made of wood. The school building cost 7000 USD. Venerable Mam Vibol, the monk at Bo Tum pagoda based in Phnom Penh paid 900USA dollars for buying the land to fill out the campus of school. Mr. Kim Meansok paid 500 USA dollars for construction worker. Sabay.com committed to provide 844 USA dollars, 553,900 riel and some supplies for study and 400 books, 550 pens and some student uniforms. Mr. Chay Mounh, a Commune Chief of Barang Thleak, provided 300,000 riel for construction workers’ food. Mr. Long Ratana, student from faculty of law gave 40 tables for students and 3 table for teachers. Mr. Khay Braseth, former actor lives in Australia promised to donate a pump well that at 1000 USD. Ford Company promised to provide a library for O’chrey primary school. Ministry of Education pledged to deliver textbooks for primary students. These commitments from various stakeholders will improve the school and enable it to help more children from the community. Mr. San Chey is the Network Fellow of ANSA-EAP for Cambodia.